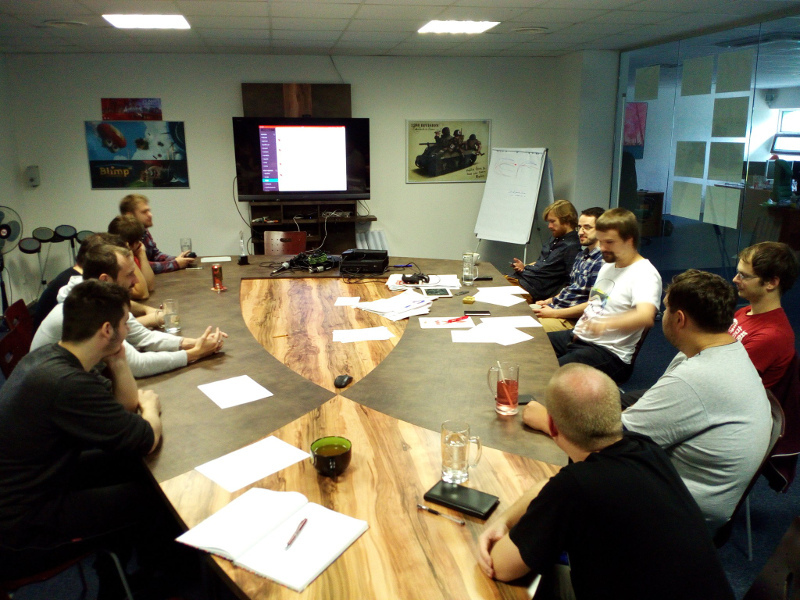 Yesterday we had a 5-hour Planet Nomads mega meeting on the next steps of Planet Nomads development. We've been collecting feedback to the game for over 20 months, and with the alpha build we got to see and hear direct hands-on experiences from Alpha Nomads. Besides alpha discussions on the forum, we saw people play the game and we saw people comment on Let's Play videos. Here are the results of all that. We are very happy with how well people received (dare we say accepted?) our building system, and that after a while it feels natural to use it. BuildVision was updated in yesterday's update too, so now you can connect multiple blocks at once to a single generator. We don't expect this to be the last change made to BuildVision, and are happy to improve this augmented reality building mode. While generally the reactions were positive, there was one recurring issue with building - it takes too long to build something as simple as a wall. Well, here's our answer - bigger prefabricated pieces. We are still experimenting with these prefabricated bigger pieces and prototyping pieces that include walls, vehicle pieces, garage doors, stairs... the models on their own look stunning, even without textures. The advantages of these are pretty straightforward - more variety, quicker building, better looks (modeled wall has much more detail than one made out of basic blocks) and one prefab is better optimized than the same thing build out of 2x7x4 blocks. The time for bigger projects is coming. Once we add textures to these prefabs, you'll see what we mean. Then they go to the alpha build. These prefabs will be an ADDITION to the existing ones. It is quite possible the existing blocks will get a texture update as well, but more about that some other time. A long time ago we held a survey asking our first Planet Nomads Advisors whether they wanted a 2-tiered or 3-tiered material system (and got a completely new answer "the more the better"). This puzzled us. So in the end we decided to have both. The crafting system will work a) with raw materials > 3D Printer > material for buildings blocks AND/OR b) raw materials > Refinery > processed material > 3D Printer > materials for building blocks. Both methods will have their advantages and disadvantages, and you can choose the one that suits you more, depending on a particular situation or your general game style. Planet Nomads will have meaningful exploration, in line with the saying "Less is more." You will not find a cave or monument everywhere, but when you do, you'll be happy you did, because of the resources hidden in these or new technology acquired. You could possibly encounter an ancient teleporting device, who knows? This will require a more detailed navigation system. We've started with compass and those beams visible from afar, but would like to add points of interest, and then a whole globe map in the end, so you know where you are on the planet and what biomes look worthy of exploring. Less is more works for survival too. Instead of having to constantly check your suit's energy and hunger/thirst levels, they will let you live longer. The idea is that you could eat three times a day, stay in perfect shape and get various bonuses from your healthy life-style, or stay hungry for four days and still be able to function normally. Generally it will be harder to get food, but when you do, you can feel safe... for a while longer. Two months ago we did not see these coming. A month ago we thought maybe. Now it's close to 100% confirmed. The skill system will be very simple and very fitting for Planet Nomads - when you do things repeatedly, your skill increases and you get better doing them. When you are reborn (AKA you are not careful enough and die), you lose these skills. As for the story... there's going to be a mysterious underlying story of "Who am I? How did I get here? What am I doing?" but the only way of getting the answers is through playing the game. We're not telling any details. The Early Access is mainly about adding survival (and re-adding those animals and improving their visuals and behavior) and crafting, thus turning the current alpha into a fully fledged game. Of course, there will be more things added in between. Follow us through to know which. Alpha Nomads may have noticed Planet Nomads updating on Steam yesterday. The biggest news includes huge physics improvements and memory leaks fixes. Also two new building blocks - magnetic jack and a wider cockpit. Check here for the complete list of changes. Looks like we're going to have a new episode of Nomadic Journals next week with more details, so stay tuned. Shout-out to our Alpha testers for providing feedback and reporting bugs, lot of the above is coming from you, so thank you!